What is the Rand doing? 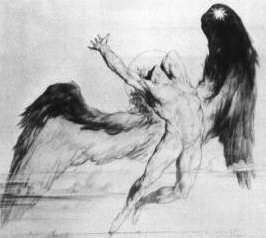 The dream of FLIGHT: Since the dawn of mankind, we have dreamt of flying. Early sketches on animal hides and on rocks depicted man with wings. Even today, we marvel at birds soaring the skies. 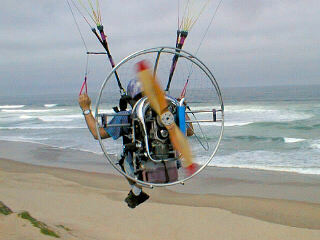 The Paramotor is a backpack-style aircraft engine, designed to convert paraglider wings to Powered Paragliding (PPG). This personal aircraft may be flown safely on most calm-weather days and requires minimal training by aviation standards. Unpowered Flight: Paraglider wings are usually flown without engines from hills or mountains, or can be towed aloft using a special winch. 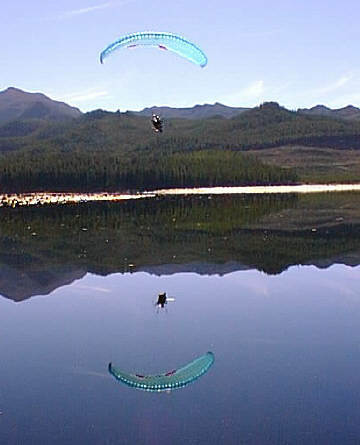 In order to extend the flight, the paraglider pilot needs to find rising air (lift) in the form of warmer air rising in "thermals", or Ridge-lift, where the wind is deflected upward by mountain slopes. Finding and using lift to stay aloft is known as soaring. Without this lift, a paraglider will glide, gradually descending until reaching the ground. Powered Flight: Combining a paraglider with a backpack engine driving a propeller (a paramotor), forms a Powered Paraglider which can be flown from level ground, without the need for hills, mountains, a winch, wind or thermals. Thrust from the engine and propeller is used to gain or maintain height and the pilot may cover vast distances without the assistance of wind or thermals. 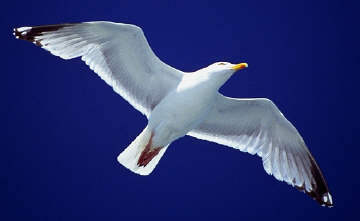 The engine may be switched off to glide or soar as desired and re-started in flight when required. 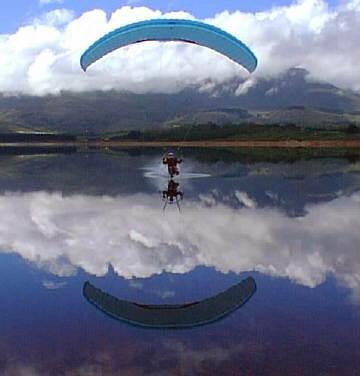 Powered Paragliding (PPG) is the most accessible form of powered flight in terms of cost of equipment, cost of training and licensing, as well as running costs. No other form of powered aviation is as accessible nor as affordable as PPG. 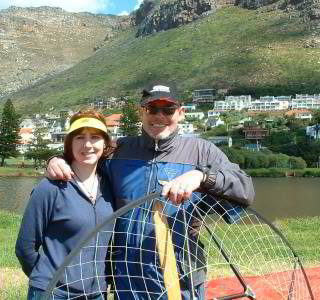 The primary purpose of this site and our business is to introduce powered paragliding to South Africa and its people. We offer training courses up to full PPG Pilot's License, as well as equipment and accessories. 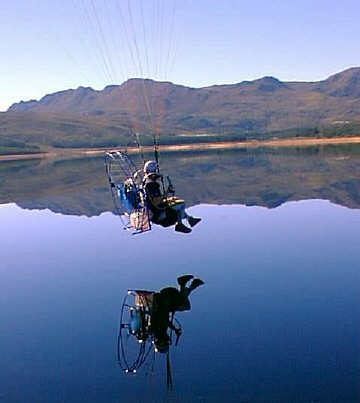 Our secondary purpose is to arrange Powered Paragliding special events (or technical support) both locally, and abroad. We are developing a series of specialised and customised PPG tours of South Africa for foreign PPG pilots. PPG instructors and dealers are welcome to approach us for a customised tour to suit your needs. Bring your students, flying buddies and customers for a memorable trip to South Africa. We also do specialised Aerial Photography (from paramotors and conventional aircraft), Aerial Advertising through branded wings, and fly at special events to attract people to your event. Extensive technical support and specialised equipment manufacture for the Middle East. Organising the South African group (of 15) participating in the 2005 New Zealand paramotor tour. We provide technical support on all brands and are keen to assist wherever possible on motors, takeoff techniques, flight theory, flying sites, local airspace, local regulations, or whatever. Feel free to browse our Web-pages here and please contact us with any questions regarding our products, or powered paragliding in general.